Red Ribbon Week kicked off October 23rd and celebrates the 30th year of being the nation’s largest and oldest unified drug prevention campaign. Red Ribbon Week began in 1985 in response to the murder of DEA Agent Enrique Camarena by drug traffickers. Families of the community soon rallied for the fallen agent by wearing a piece of red cloth to signify a unified stance against drugs. Since the origin, the Red Ribbon campaign has grown to an annual national phenomenon that focuses on bringing a visible stance against drugs to communities and to educate youth on the dangers that drugs present. 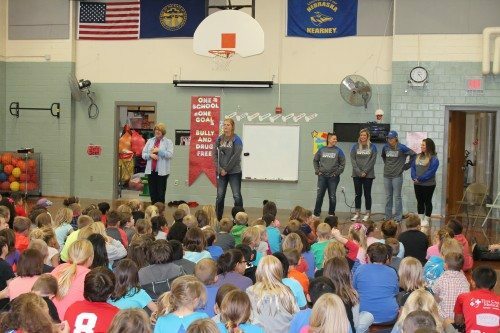 Emerson elementary students gather to hear from UNK athletes on why they choose to be drug free. Buffalo County is certainly not excluded from the activities of Red Ribbon Week. Five schools in the county planned different activities that particularly benefited their area and the stance against drugs, such as creating drug-free pledges for students to sign. The Positive Pressure Coalition at Buffalo County Community Partners has taken additional steps to unify the county. The Elks Lodge #984 partnered with Positive Pressure to handout 40 Developmental Asset Resources and Substance Abuse Prevention Resources to the schools throughout the county in order to create a unified look at how to move forward with drug prevention. We will also be recognizing the Youth Advisory Board at each school for their involvement with the Community Partners to build on our relationship with the youth leaders of the region.